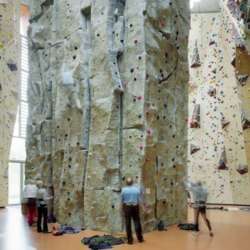 You must be a member of the Munich Rock Climbing Group to attend this activity. Would you like to join this group? Lead climbers (NO BEGINNERS for lead climbing though!!!) and lovers of bouldering are welcome! Also for those who only would like to do TopRope Climbing (no lead climbing). I just need to know who only would like to TopRope and who knows how to Lead Climb in order to have a leveled group. The idea is to meet and pair up to go climbing in small groups of 2 or 3. At the end of the climbing fun, we will meet upstairs to have some food and a drink in the cafeteria. Please ask if you have further questions. P.S: If you are climbing with us for the first time, please send me a PM so that I´m aware I need to be looking out for a new face...and cancel if you can´t make it! P.P.S: This is not a climbing course. Lead / top rope climbing only for experienced climbers who know how to belay, which includes tying knots and the use of belaying devices. There are no experts or instructors in this group and you will not receive any sort of tuition (lessons, training or instruction), climbing gear or any other equipment (but you can hire it at the location) and the group consuls are not responsible for your climbing development or safety. Make sure you are insured properly!